Cover to Hradec Kralove in 1936. Personal cheques accepted in £GB and drawn on UK bank. IMAGES are Provided for ALL the COVERS in this LOT ! Neat pair of Czech covers to the UK in 1937-8. The other cover has a smattering of different definitives. Neat covers shortly before the German takeover. CZECHOSLOVAKIA #61A cat. FINE CONDITION. Czechoslovakia 1937 FDC T G Masaryk KKA_13901. We will combine shipping for Purchases. It is 10 cents for each additional item within the US & 25 cents for each additional item outside of the US. Please note that this does not apply to collections. Please wait for a combined invoice before making payment. Feel free to contact us if you have any questions. Please send all messages through eBay's messaging system. Czechoslovakia 1948 FDC Flag over Field First Day Cover. We will combine shipping for Purchases. It is 10 cents for each additional item within the US & 25 cents for each additional item outside of the US. Please note that this does not apply to collections. Please wait for a combined invoice before making payment. Feel free to contact us if you have any questions. Please send all messages through eBay's messaging system. Set of 1 value (1v Set): 27Kc. You will be back for more! Set of 1 value (1v Set): 16Kc. You will be back for more! New listing21x Czechoslovakia Commercial Mail Covers. See pics for info. Czechoslovakia DK Prague Censor 1939 July 27 to Chicago IL. Item ID: bbz_1074 Condition: Creased Toning & Small Tears. Czechoslovakia 1978 FDC Stamps of all Countries KKA_15067. We will combine shipping for Purchases. It is 10 cents for each additional item within the US & 25 cents for each additional item outside of the US. Please note that this does not apply to collections. Please wait for a combined invoice before making payment. Feel free to contact us if you have any questions. Please send all messages through eBay's messaging system. 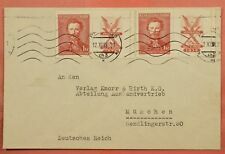 Mayfairstamps CZECHOSLOVAKIA ROUDNICI NAD LABEM JULY 7 1946 AD TO DOKSANY. We will combine shipping for Purchases. It is 10 cents for each additional item within the US & 25 cents for each additional item outside of the US. Please note that this does not apply to collections. Please wait for a combined invoice before making payment. Feel free to contact us if you have any questions. Please send all messages through eBay's messaging system. Czechoslovakia 1958 FDC UNESCO United Nations KKA_13863. We will combine shipping for Purchases. It is 10 cents for each additional item within the US & 25 cents for each additional item outside of the US. Please note that this does not apply to collections. Please wait for a combined invoice before making payment. Feel free to contact us if you have any questions. Please send all messages through eBay's messaging system. Topic Exhibition. UPC Does not apply. Year of Issue #N/A. Czechoslovakia 1967 FDC Brno arch 2 40 h Stamps First Day Cover. We will combine shipping for Purchases. It is 10 cents for each additional item within the US & 25 cents for each additional item outside of the US. Please note that this does not apply to collections. Please wait for a combined invoice before making payment. Feel free to contact us if you have any questions. Please send all messages through eBay's messaging system. 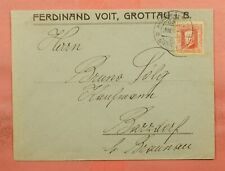 Czechoslovakia 1967 FDC Bratislava First Day Cover. We will combine shipping for Purchases. It is 10 cents for each additional item within the US & 25 cents for each additional item outside of the US. Please note that this does not apply to collections. Please wait for a combined invoice before making payment. Feel free to contact us if you have any questions. Please send all messages through eBay's messaging system. Czechoslovakia 1945 FDC Coat of Arms 100 Let Drahy Olomoucko Prazske KKA_15077. We will combine shipping for Purchases. It is 10 cents for each additional item within the US & 25 cents for each additional item outside of the US. Please note that this does not apply to collections. Please wait for a combined invoice before making payment. Feel free to contact us if you have any questions. Please send all messages through eBay's messaging system.